Infrared sensor based Electromagnetic Disk Braking system" is submitted in partial fulfillment of the requirement for the award of the Diploma of Mechanical Engineering. The contents of this report includes a brief description of the Electro-Magnetic disk braking system, supplemented by a good numbers of necessary and descriptive figures which makes this projects report very easy to understand. A brake is a mechanical device which inhibits motion or device for slowing or stopping motion, as of a vehicle, especially by contact friction. You can also Subscribe to FINAL YEAR PROJECT'S by Email for more such projects and seminar. Electromagnetic disk braking system slows an objects by creating an eddy current through electromagnetic induction which create resistance. When electro magnetic are used, control of the breaking action is made possible by varying the strength of the magnetic field of the electromagnets creates eddy currents in the discs. This project is operated in two modes Viz. Foot pad mode & Infrared Sensor based auto stop mode. In first mode, we are using one manual foot pad with scaling positioning sensor. These sensors give input to controlling circuit. This controlling circuit control provides current to electromagnet for applying brake to the rotating dice. In second mode, we are Applying instant brake with the help of infrared sensor to avoid short distance accident, in this mode controlling unit take self decision for short distance brake to avoid accident. 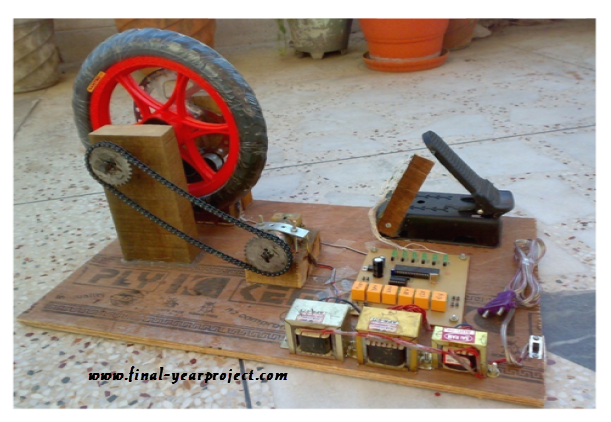 This project report includes circuit diagram, working, principle etc. Use it for your reference and study work only.